Dutch lyric soprano Barbara Schilstra is Diva of the Month December 2016/January 2017 in the wake of her lead part in 401Concerts 4, in the Concert Hall of the library at Spui, The Hague, 18 december. She will sing there an array of arias and duets from Dutch operas by Cornelis Dopper, Daniël de Lange, Gerard von Brucken Fock, Emile von Brucken-Fock, Willem Landré, Jan van Gilse, Jan Brandts Buys en Richard Hageman. Schilstra's voice is marked by a silvery timbre and genuine personality. Till date the highlight of her career was a tour as Saffi in Gypsy Baron that took her from Vienna throughout Germany. The next highlight will be the December 18 concert! Who is curious after her voice is welcome to attend this coproduction with the Netherlands Music Institute. Entrance is Free! 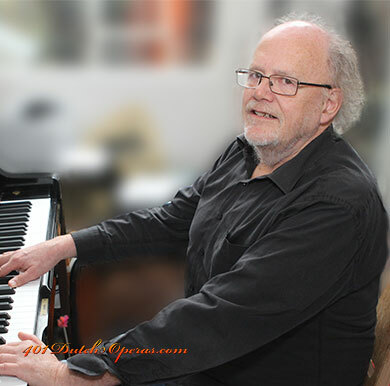 Our 401DutchOperas house pianist, the brilliant Wolter Willemsen, has died completely unexpectedly in his house on June 18. On behalf of our team, in particular also our vocal ensemble consisting of Barbara Schilstra, Hendrik Vonk, Lilian van de Zande and since recently also Hans de Vries, we wish his friends and family strength. Wolter was exceptionally gifted, he could take you to realms of sound in Dutch music that you had never believed possible. We had planned a studio recording of all the music we had been working on for the past two years: operas by Von Brucken Fock, Jan van Gilse, Jan Brandts Buys and some others. That we have to cancel this recording is a true blow to those wodnerful Dutch composers. Dear Wolter, wherever you are on the journey to the big unknown, we do not wish you a quiet journey at all, we wish you a lot of music and a Bösendörfer! Bass-baritone Andreas Goetze is Divo of the Month November in the wake of his upcoming appearance in 401Concerts 4 on December 18, 2016 in the concert hall of The Hague’s Public Library (OBA). Goetze will appear there as Haron in Jan van Gilse’s opera Helga von Stavern (1913) and as the monk in Cornelis Dopper's The Blind Girl of Castle Cuillé (1894). Goetze is one of The Netherlands’s rising bass-baritone stars. He is versatile, appearing both in oratorio, opera and repertoire ranging from Haydn to modern composers. The versatile soprano Julia Bronkhorst made numerous notable recordings in less known repertoire, among ese many Dutch song recordings and productions that were oriented toward South-African song repertoire. We bring an extensive portrait of this modest Diva whom we have followed with the video camera for some years. This resulted in unique world premiere recordings of Leo Samama's 'Ubuntu' and Caroline Ansink's opera Polish jews in Plan South. Six downloads and an array of photographs and videos provide a complete survey of her career since 1987. Together with the world famous song and oratorio soprano Elly Ameling we have produced a unique video portrait in which she looks back at her career and forward to the future. An exceptional portrait of an exceptional Diva! The world famous Dutch alto Aafje Heynis passed away from 17 on 18 December 2015, at the age of 91. 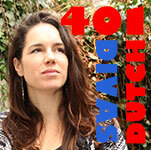 401DutchDivas looks back at her career in an exclusve English language portrait, with extensive interview excerpts in a special page. Kommt der neue Held gegangen... Since his debut in 1989 Dutch Heldentenor Hendrik Vonk has carved out an impressive career that has reaped him triumphs in Wagner en Strauss roles such as Tannhäuser, Tristan, Bacchus (Ariadne auf Naxos), Menelaus (Ägyptische Helena) in Leipzig, Neuschwannstein, La Scala Milan and many other operatic tempels. 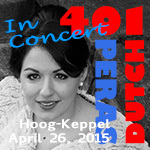 401DutchDivas is proud to announce Vonk's participation in 401Concerts 4. There, on December 18 in the OBA Concert Hall at Spui he will perform an array of highlights from Dutch operas in a coproduction with Netherlands Music Institute. Entrance is free of charge. Vonk's portrait on our website features impressive videos and mp3s that place him in a lineage with the likes of Hendrik Appels and Jacques Urlus to Hans Kaart, Adriaan van Limpt and Frank van Aken. Flemish soprano Jolien De Gendt appeared at the very first 401DutchDivas concert of April 26, 2015. we selected her for this historicconcert with Dutch and Flemish opera arias and duets after she enchanted us during a Lyrica Ghent performance of Miry's Bouchard d'Avesnes and later also as Blondchen Mozart's Enführung. The Frisian bass-baritone Rom Kalma had a celebrated concert and oratorio career in the Netherlands and Germany from the 1950's to the 1970's. 401DutchDivas honors him here with an extensive biography with lots of sound and vision as well as with 5 downloads: in Lieder, Opera, Oratorio, Popular Song and a video of Die Winterreise. On November 26 2015 there was a Symposium in the Ghent Opera House on past, present and future of Flemish Operas. Following this symposium a concert with Flemish opera arias was given, try-out voor our 401Concerts Nr. 2 download. In 2013 we were so enthusiastic regarding tenor Denzil Delaere's appearance in Miry's Charles Quint, that we made him divo of the month. 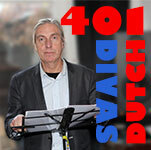 We promised him that we would invite him to our own 401DutchDivas concerts, which we wereplanning to organize. On 26 April 2015 he ultimately appeared at our concerts, together with soprano Jolien De Gendt , in a unqiue program of arias and duets from Dutch and Flemish operas. 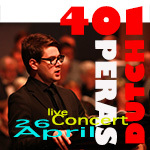 The Flemish pianist Pieter Dhoore shall accompany soprano Jolien De Gendt and tenor Denzil Delaere on the piano at the first ever 401DutchOperas/ 401DutchDivas live concert with arias and duets from Dutch and Flemish operas (April 26, 2015).